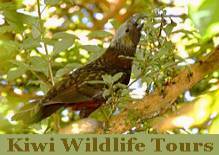 Birdsong (when it finishes loading) is the rare NZ Kaka, a forest-parrot song-bird. From time to time (when i manage to escape the endless chores for a couple of days) i climb Mt Elliot and go tramping (known to the rest of the world as 'hiking'). Mt Elliot is quite remote, being a half hour drive along a single-lane gravel road through bush to find the nearest village. But over the BACK of Mt Elliot is wilderness, millions of acres with no roads. Just below the tree-line i was investigated by some kaka (A large melodious forest parrot - the background birdsong on this page), but despite scoping me out from several different vantage points they were too mobile to present me any good photos (this photo is 'borrowed' from Kiwi Wildlife Tours - click the pic' to visit their site). 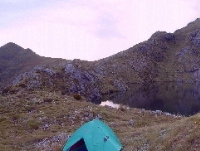 Just on the other side of the ridge, high above the tree-line is a small lake. On the far bank, just below the mountain's peak, is a small cave over-looking the lake. 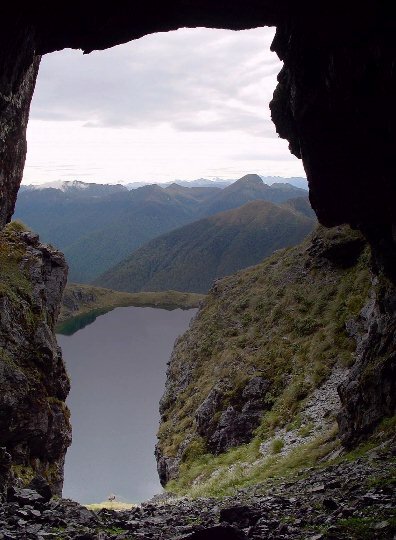 The cave looks over the lake and the mountains beyond - the view from the top shows range after range untouched by civilisation.